The term petit fours is traditionally used to describe the miniature cookies and cakes that accompany an afternoon coffee or tea or that are served after a meal. Petit Four is a French term that means “small oven”. In 19th century France, there were no gas ovens. Most food items were baked in a breadmaker’s oven that was a huge cabin made out of stone. They would light a fire underneath. These types of ovens took a long time to get going but once they did they became really hot for some time. The oven only had two settings. The first setting was the grand four, big oven, where the fire was at its strongest. This setting was used when the roasting meat and potatoes and other vegetables. The second setting was the petit four which was a lower temperature allowing the correct heat to cook pastries. You don’t have to be a French pastry chef to make petit fours. Try out our recipe below and impress your friends and family members at your Easter brunch and serve these delicious and festive petit fours. Preheat the oven to 350-degrees and prepare a 9×5 loaf pan by greasing lightly with butter. Mix together the butter, cream cheese salt, sugar, baking powder, vanilla and almond extracts in a medium bowl until well combined. Beat in the eggs one at a time, then beat for about 3 minutes. Add the milk and gradually add the flour and mix on low until just combined. Pour the batter into the pan (be sure it’s a 9×5 pan!) and bake for 50- minutes until a toothpick comes out clean. Remove from the oven and let rest for 5 minutes before turning out onto a wire rack to cool. 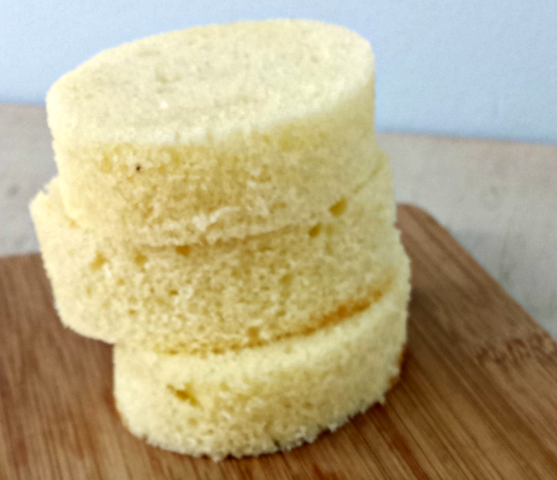 Once the cake has cooled completely, cut into 1-inch slices. Use an oval-shaped cookie cutter to cut out the egg shapes. Gently dust off any crumbs. Spread about 1 teaspoon of strawberry jam on half the ovals. Top with a second oval to make a sandwich. In a double boiler over simmering water, mix the ingredients except for the food coloring and sprinkles until warmed through. Mix until smooth. Stir in desired food coloring (optional). Cool for 7-8 minutes before pouring over the cakes. Line a baking sheet with parchment paper, then top with a wire baking rack. Set the cake sandwiches on the wire rack about an inch from one another. Pour the icing over the cakes, then decorate with sprinkles as desired. Let the icing set up – about 1-2 hours. Serve at room temperature or chilled. 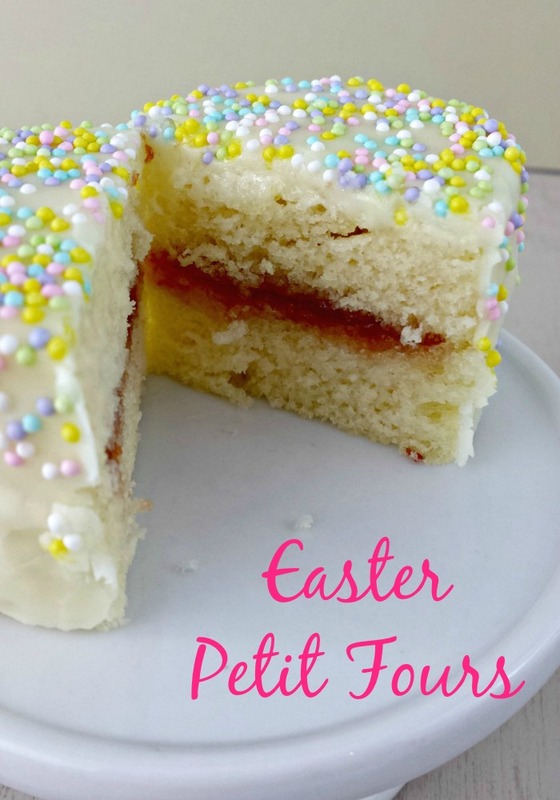 These petit fours are not only perfect for Easter, but for any celebrations including bridal and baby showers! Okay, I am totally going to have to make this! You had me at the first picture. Those are so easy to make, so I think I am going to bring these to my parents house on Easter. They are so cute. I love using those nonpareils. They make deserts fancy! These look delicious! I know my daughter would love making them for Easter’s dessert. And they’re cute! How fun to make the yourself! I bet they taste better than specialty ordered or store bought too. So cute and pretty! These would look great on any Easter table, for sure! This is a first for me . I have never seen any dessert like this. It looks amazing. You did really good. Ooh, these sound so yummy! And they look so pretty too. What! Those are just so cute! I’d love to make them for Easter! Yum. Your cake looks amazing. You are making me hungry. These are really beautiful. What a great finger food idea. I would serve these with tea or coffee for my guests. Thanks for the idea. Ooh, those look gorgeous. Perfect for afternoon tea! Those are so festive and yummy for Easter. And anything this simple to whip up deserves an A+ in my book! 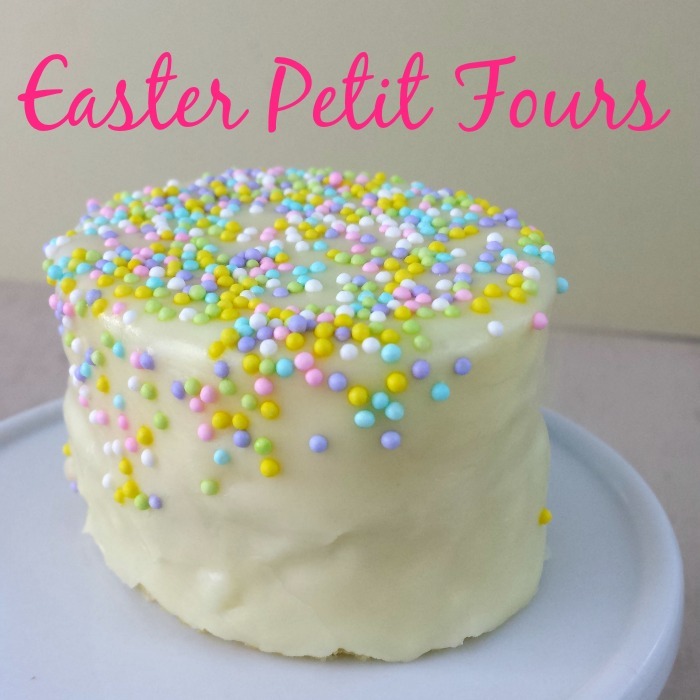 These mini cakes look super yummy, what a perfect thign to have for Easter! Looks awesome and delicious! I bet the final output will be too soft & tasty making it a perfect cake. Will definitely try this for sure. Thanks for sharing the yummy recipe. Oh this looks really really good. I think even I would be able to make this and hope it comes out as good as it looks. Hopefully it tastes good too, but I’m sure whether or not it does the kids would enjoy it. So cute and colorful – definitely has a feel of easter, this would be good! These look amazing, and I will definitely be making these soon! Maybe not for Easter, but soon! These are so cute! And from your pictures and directions it actually doesn’t seem as hard to make as it looks! I will def have to try this one out soon. Thank you for the recipe! These are so cute Im going to make them for my sons birthday. What a great idea. Thanks for the recipe. These look delicious!!! I love petit fours!! These are so adorable! 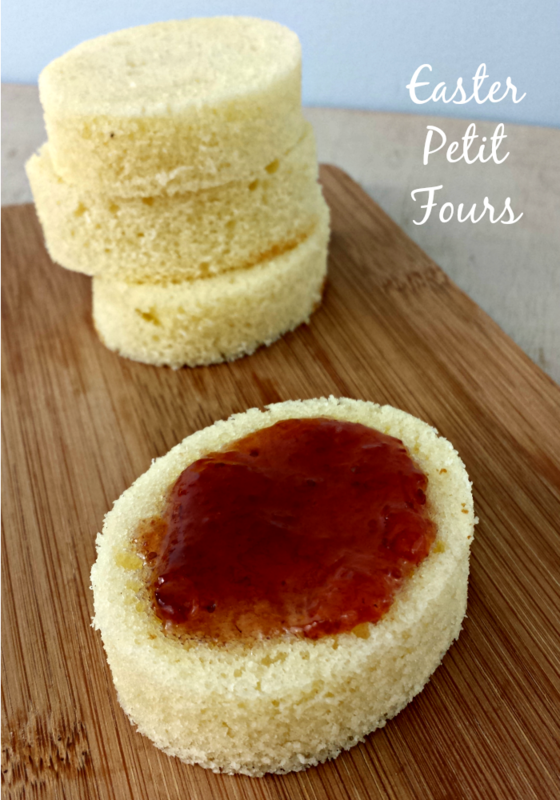 I remember the first time I made petit fours, I was a tween and thought they were cute, but a little hard and messy – I should have had this recipe then! I still love petit fours and want to make them! 1. I have never made petit fours before. Thank you for this gorgeous recipe– it looks amazing! Sounds like alot of trouble to go to for a piece of cake. Too much time and mess. Oh how pretty. I remember being intrigued by petit fours as a child and wanting to make them. I just realize I haven’t yet! I’d love to try these!